Dad, will you please quit? The doctor thinks the girls have the flu. Fortunately this strain that has been going around is mild in comparison to the seasonal flu. It mainly causes fever and belly ache and cough. Not so much the aches and pains that the seasonal flu causes. We will find out tomorrow for sure when the test results come back. 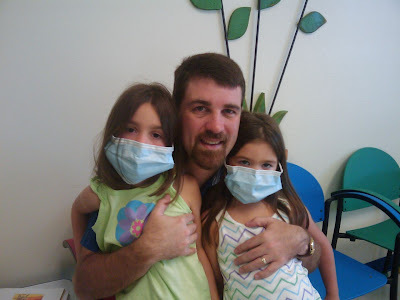 Our doctors office makes anyone with a cough and fever wear the face masks. They were a little big, but the girls did okay with them. So far Luke is good, I have had to fight constantly to keep the girls away from him, but so far so good. And he is breastfed so hopefully we'll miss this round with him. I did this cake a while back and forgot to post it. I know some people had asked to see it. Isabelle: Did Wicky have to get his mouth washed out with soap a lot when he was little? Mommy: Do you think he was bad and said ugly things a lot? Isabelle: Well, he just blows bubbles all the time. Will was playing with soap bubbles during bath time. We played with the camera this past weekend when we were in Fort Walton Beach for a wedding. Here are some of the photos. Here is the proof that Will actually got on the tea cups. But he wouldn't even let his 4-year old daughter turn it. Isabelle: I think Meghan has the swine flu. Anna: How did she get that? Isabelle: She got near a Swine. Mommy: What is a swine, Isabelle? Isabelle: You remember the Swan Princess movie? Isabelle: That is a swine. She got near one of those. Today we began the day visiting Disney's Animal Kingdom. Anna was just a hair too short to ride Expedition Everest but Isabelle rode it again and loved it. Well, at least she said she loved it. The finger nail marks on my arm may prove otherwise. We rode the Kali River Rapids, met some characters and then left to go to the Magic Kingdom. We only stayed at the Magic Kingdom for an hour before we had to head over to Chef Mickey's for our dinner reservations. We arranged for them to bring a cake to the table for Kate. She was not surprised since Isabelle kind of let the secret get out. We ended the evening by watching the Wishes fireworks show from the balcony at the Contemporary Resort. We are having a great time at Disney World. After going on a few rides at the Magic Kingdom this morning, Isabelle started running a mild fever. We brought her to the First Aid Center and took her temperature. They gave her some Tylenol and she felt much better. We had lunch at the Coral Reef in EPCOT. The steak was good, but the were a little skimpy with the French Fries.